"Persepolis: A Glance at an Empire offers the viewer a rich, instructive and rewarding recreation of the architectural marvels of Persepolis. " "With Persepolis, a Glance at an Empire, we have the first digital reconstruction of one of the wonders of the ancient world, the palaces of Persepolis, which is based on the works of Friedrich Krefter and Erich Schmidt. This work is the outcome of the efforts of architects Kourosh Afhami and Wolfgang Gambke, who with the help of different experts brought history, archaeology, and traditions together in an impressive manner for the viewer. In the film, the evaluated findings of archaeologists and factual evidence are completed with historical events Through digital reconstruction, the viewer obtains a 3D image of the grandeur and splendor of the colors of Iranian palaces. This film which takes into consideration the most recent research data, successfully displays manifestations of Iran's pre-Islamic era." 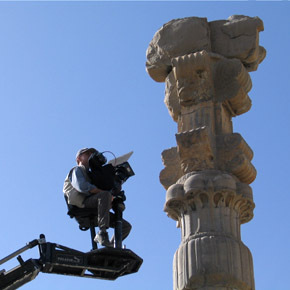 Using the methods of digitalization, the TV documentary "Persepolis, a Reconstruction" rebuilds Persepolis at the time of the Achaemenid Empire. The film is about Persepolis and its reconstruction since the 1930's, when the first reconstruction of the "Harem" (the Museum today) was completed by Friedrich Krefter and Ernst Herzfeld based on archeological findings, until now, when architects Kourosh Afhami and Wolfgang Gambke use computer technology for its virtual reconstruction based primarily on Krefter’s work "Persepolis-Rekonstruktionen" and the documentation obtained from the excavations led by E.F. Schmidt along with their own recent onsite research results. In addition, this virtual reconstruction examines color schemes for the first time which may provide a forum for discussions. The film briefly explores the methodology of this digital reconstruction and its sources using novel pictures and HDTV technology to rebuild a possible version of the original Persepolis. In addition, it also presents the role of Persepolis in modern day Iran especially with respect to the Norouz celebrations.